I like the earlier Arovane that I've heard, but don't know this one yet. Could you add any sort of comment or evaluation? I 2nd that - 'atol scrap' is better, although 'lilies' isn't bad - just not a stand out. Mahavishnu Orchestra - The Inner Mounting Flame, Birds of Fire, Apocalypse, Between Nothingness & Eternity, and The Lost Trident Sessions. paul bradley - chroma [twenty hertz 2007] - gorgeous drones. In another thread, I think Alan(Undershadow) described Chroma as "wide open". Perfect. pantha du prince - this bliss  - irresistible techno. I agree. I'd add that this artist is one of the best doing techno and tech-house with a sort of leftfield quasi-ambient sensibility. In fact, I'd add further that Dial Records is great for this sort of stuff (cf. Lawrence, Carsten Jost, Efdemin), every bit as good as Kompakt's best techno stuff. Arovane would be in my top three of 'IDM' artists 1995-2005 (taking those 10 years as the main years of endeavour in this somewhat loosely defined sub-genre). I agree with jkn - "Atol Scrap" is easily his finest work; a stand-out release in the field of beat-driven electronica that draws on Autechre's legacy of skittery beats and abstraction, then, in my view, improves upon it by introducing a quite individual melodic sensibility. I'd also put Bola (a much underrated artist) up in that category. Glad you can dig it, Forrest. "Spectra" is currently my favourite album on Twenty Hertz, though I do like the eponymous disc by Bradley you mention. It's a mood thing: most of "Spectra" is radiant and winsome whereas "Twenty Hertz" is dark and mysterious. One of the great, long-lost ambient classics I had never been fortunate enough to hear, until today. Just plain beautiful, simple, and inspiring. 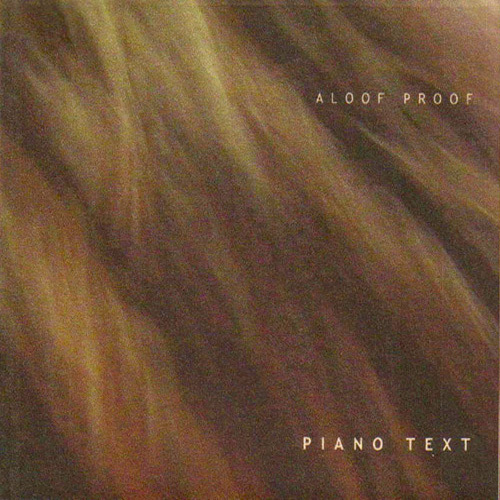 Definitely looking forward to future Aloof Proof reissues... thank you, Infraction! Not sure why you jumped from INFX024 to INFX030, but this album's worth 6 regular albums, so maybe that's why. Mike, I believe Jason numbers his planned INFX releases in advance and their release dates are not chronological. The intervening catalogue numbers (apart from INFX 025, which was the "Jessa" bonus disc that went with special editions of Northern "Drawn") are, AFAIK, those projected to drop in coming months by Eluder, Celer, Ourson, and Craig Bethell (the last being a non-ambient alt-pop release ). The second release by these two. The first track is very similar to the material on the first incarnation. The remaining 11 tracks go further down the road of quirky beats and subtle noise. This double CD on ECM is really gorgeous. For fans of the abstract-yet-lyrical piano trio music the label excels in producing. I'm slowly working on more Stenson releases having been inititally bewitched by "Goodbye" a couple of years ago. Geir just sent me these. I always loved "Insomnia" and now I can pass on the original version with the awful cover! The other two are new for me. I never knew his more techno, pre-Substrata work. A nice treat with typically fine production values. The re-packaging is nicely done! You're welcome, but I think you must have me confused with someone else! Oh. Wait a minute. You're right. I meant Merv Griffin! Know where I can reach him? Chemical Brothers, "Loops of Fury". From back when they were still interesting; this is frantic, driven, and pretty damn good. With "Exit Planet Dust", their high water mark. Black Lung, "Silent weapons for silent wars" and "Profound and sentimental journey". Both interesting, full of fascinating sounds and superb production. Not especially memorable, but worth a listen. I think one (or more) Black Lung members are/were also in Soma, a truly fantastic band; check out their three releases on Extreme records; "Hollow Earth" is essential. Listened three times this morning - nice backdrop for an icy morning at work. A Tresor label comp of Detroit/Berlin techno stuff. Mostly a good release - a couple I tend to skip over - but mostly good.